The irony is hard to miss. 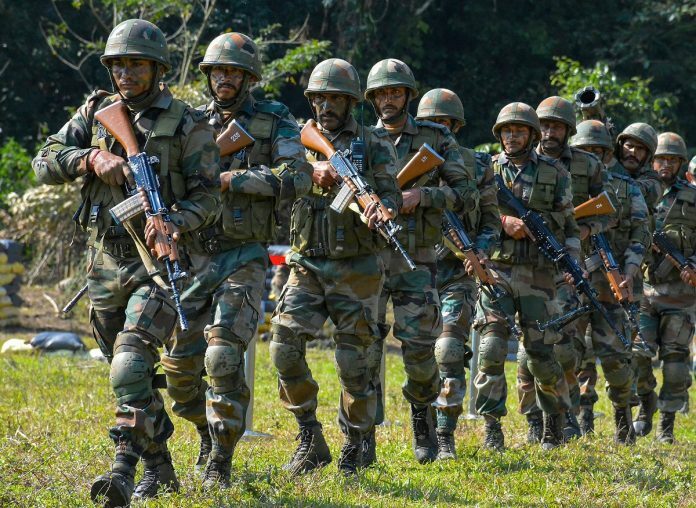 While India celebrates the performance of the armed forces in the recent, short-lived conflict with Pakistan in Balakot and the political class exploits them for electoral gains, the military personnel continue to fight a battle with the government in the Supreme Court. The case pertains to not granting non-functional upgradation (NFU) to the officers of the armed forces that members of some other central services enjoy. The government has been delaying and dithering on financially compensating India’s armed forces that lack adequate promotional avenues. What is NFU? How does it work? Civil services are classified into All India Services – Indian Administrative Service (IAS), Indian Police Service (IPS) and Indian Forest Service (IFS) – and Central Civil Services (CCS) – Group A and Group B. Based on cadre review, the CCS Group A have been further sub-divided into Organised (constituted by the Cadre Controlling Authority) and Non-Organised. Keeping in view the stagnation in promotion of CCS Group A officers, the Sixth Central Pay Commission recommended NFU, linking their pay scales with those of their batch officers in the IAS. So, two years after the IAS officers are promoted, their batchmates in these services are automatically upgraded to the same level on a non-functional basis, irrespective of whether they are actually promoted or not. The usual system of promotion, meanwhile, continues. This upgrading is applicable for all ranks of officers up to the rank of Additional Secretary. The government had initially granted NFU to only CCS Group A (Organised) even though the pay commission made no such distinction. In 2008 it was extended to the All India Services — IPS and IFS. The IAS as such is not entitled to NFU but its promotions are used as a benchmark as these are much faster than the other services. The officers of the armed forces face maximum stagnation due to the conical pyramidical structure. An IAS officer gets promoted to the rank of Joint Secretary, equivalent to a Major General, after 18 to 20 years in service. An army officer becomes due for promotion to the rank of Major General with 32 to 33 years in service. Most army officers retire in the rank of Colonel at age of 54 years, while all IAS officers retire as Additional Secretary and above, which is equivalent to Lt Gen and above. The government’s stand in not extending the NFU to the armed forces and the Central Armed Police Forces (CAPF) was that these two forces do not meet the criteria of being ‘Organised’ as per the policy laid down. A bitter battle has ensued over the last decade between the CAPF and the Ministry of Home Affairs, and between the armed forces and the Ministry of Defence. The CAPF’s case went to the Supreme Court, which upheld the judgment of the Delhi High Court on 5 February 2019, which granted them NFU. The armed forces, on the other hand, found hurdle in a government unwilling to extend the NFU to them. Years after first taking up the matter in 2008, the armed forces strongly presented its case before the Seventh Central Pay Commission. While its chairman supported their inclusion in the NFU system, the other two members found the NFU concept flawed. They said it was unmeritorious and must be done away with for all services. The government took advantage of this ambiguity and summarily rejected the case, causing a lot of resentment among both the serving and the retired officers. After dilly-dallying by the government at subsequent hearings, the case was finally heard on 12 March 2019. The judgement stands reserved. Policy making is government’s exclusive domain.Yes, it is indeed, but all our pay commissions have correlated the pay and allowances of all services, including the armed forces, and tried to maintain parity. The government should be responsible enough to ensure that its policies are on an equal basis and not selective and biased against the armed forces. Constitutional right to equality enshrined in Article 14 and 16 is not applicable to armed forces.This is untenable. While Article 33 of theConstitution empowers Parliament to restrict or abrogate somefundamental rights of the armed forces, to misinterpret it to include right to equality in salary and status goes against the very spirit of theConstitution. NFU to armed forces will have adverse effect on status, command and control, discipline, efficiency and morale, and reduce the desire to aspire for higher ranks. If anything, the NFU will only provide a greater degree of motivation to super ceded officers. The armed forces have enough safeguards in form of rules, regulations, law and the appraisal system to deal with errant, non-motivated and non performing officers. NFU will result in additional financial burden on government.On 12 March 2019 the government for the first time gave out the details of the financial burden – ₹1,065 crore for arrears and ₹269 crore as annual recurring cost. If the financial burden is unbearable, then NFU should be scrapped for all services. The arrears can be given in instalments and Rs 269 crore is hardly a burden on the government. Armed forces enjoy various prerequisites and amenities that are not available to the civil services.Most of the ‘subsidised’ amenities are available at par to the other services in one form or the other. Apart from these, the other facilities are from the armed forces private funds built up over the years through contributions by all ranks. This argument only reflects on the petty mind of the bureaucrats. The armed forces are entitled to Military Service Pay (MSP).The MSP is based on the erstwhile Special Disturbance Allowance. It is meant to address the intangible constraints and disadvantages unique to military personnel. It is certainly not a compensation for financial loss due to stagnation which is the basis for the NFU. Either due to ignorance or guided by inappropriate advice, the governments since Independence have discriminated against the armed forces in the matter of pay and allowance. Anomalies of pay commissions are only resolved through prolonged litigation stretching over 10-15 years. The government should be responsible enough to ensure that its policies are on an equal basis and not selective and biased against the armed forces. The armed forces are in the hearts and minds of the public and the political parties hope to win elections by exploiting the soldiers, and yet the government is fighting them tooth and nail in courts for a mere Rs 269 crore. A lot has been said about NFFU and in very complicated ways. SIMPLY, NFFU is essential to cater for stagnation, not due to lack of capabilities but due to a lack of vacancies. The Armed Forces have the most extensive qualification Courses and exams, coupled with a very stringent selection system. However, a lack of vacancies in senior ranks, results in “Non Empanelment” of otherwise qualified Officers, leading to mass stagnation. Due to their Organisational Structure, the Armed Forces cannot increase the numbers of their Senior Ranks, while the other Central Government Services have increased their senior rank vacancies by as much as five times. It is surprising that despite a manifold increase in their senior ranks, the Central Government Services have been Granted NFFU, whereas the Armed Forces who face the maximum stagnation, are denied NFFU. Moreover, while reserving their judgement in the NFFU Case, the SC Bench has asked for comments from other Central Services who have already got NFFU and have no knowledge of the functioning or tasks of the Armed Forces. What sort of Partisan treatment is this for the Protectors of the Nation. Can there be a greater injustice to the most deserving. The whole NFU thing is seriously flawed. What is also flawed is that the IAS is exclusively getting much faster promotions. The other central services should be entitled to equal promotion opportunity. In fact When Gen Panag was a cadet, that was the case. At that time the earlier batches of IAS and the last batches of ICS were running the show, but they did not restrict all the goodies to themselves and many central services were also getting promotion. As far as armed services are concerned, there should not be NFU either. It is immoral to dissociate pay from promotions. Unlike civil service, all ranks in the armed service don’t retire at the same age. A major will retire years before a Lt General. The presentdispensations DNA is anti employees. But the present leadership has been from beginning been only interested in showing lip sympathy to impress and win votes. People are being bludgeoned by the Bhakts as if there is no alternative. NFU is not the only thing, just before election we’re declared ,they grandly declared ECHS for Short Service Officers. But when we read the fine print it is totally contrary to what Supreme Court had directed. By the time it sinks in the elections will be over and they will have the last laugh. Shukar hai yeh lekhak section, plaatoon se upar uthaa😆..
As, per normal service rules, of military they do not have bargaining capacity like private sector and other government employees,. These employees have strong political connections to influence and intimidate and ultimately paralyse the working of Government Such opportunities are, denied to defence personnel and even a, murmur of a, soldier will be construed to be a, mutiny against Government and the punishment is, also severe. Government of the present could be a, bit magnanimous and liberal considering the conditions in which our soldiers guard our borders, with no guarantee that they can see, the dawn tomorrow. I am surprised that BJP government is, so stingy and nonchalant when it comes, to increase, the pay packet of the soldiers, at all level the levels. Service in Defence Forces, must be made more attractive. These bare facts should be known to all country men, who may take the Govt of the day to task as they love and respect the Defence forces. Surely all print n tv media are either under tight leash or sold out. Time for other media to follow free frank and fearless ‘ThePrint”. In service they will be victimised.After retirement one is free to comment. A hard hitting article which fully justifies grant of NFU to Indian Armed Forces. There can not be and should be any disparity across the board. To my point, government must restructure all pay scale as per prevailing market trends. And forces should be given additional advantage. I am not biased towards any political party.Every single entity of politics have their own ideological principles but the irony is all converges to the same focused goal which everyone understands. Now coming onto the discussion point.I may be too minuscule to comment on such issues but it is clear reflection of hypocrisy wherein the SAME GOVT is giving contrary statement.The state of DEFENCE FORCES in the nation needs review and when compared to forces of our counterparts of any other nation,a marked difference will be noticed in terms of everything thing one can think of. Irrespective of that,I am sanguine that ARMY would continue doing its task as it has been but at the same time the GIVT and policy makers need to consider the fact of life and review their views towards the DEFENCE FORCES who thinks nothing but NATION and NATIONALS. A long-awaited and hard-hitting article. Retd officers are not bound by law to keep quiet. Th issue shows how successive govts have paid lip service but stabbed the forces in the back. Of course, ungrateful fault-finding citizens who do not know about sacrifice could not care less. The IAS which makes the rules makes them for the benefit of their own, it’s almost impossible to sack or discipline either a IAS or an IPS Officer, this service was designed to be used as an instrument to subjugate people by Indias former colonial masters. When the third reich looked at a model administration to put in place in the occupied territories, to administer the lives of the conquered people, the copied the Indian Civil Service later known as the IAS as the most suitable. Britain nor the British people would ever tolerate a IAS like system or an act like the Indian police act for themselves, they administer themselves in a far more democratic and accountable manner, there civil servants are ‘servants’ not burra shaibs, without the privileges, power rests in local democracy and with the people it is similar administration in Germany. One of the reason the ex colonies remained third world is because this exploitative cadre like the iCS/IAS was retained to be used by exploitative politicians. Sardar Patel did a grave injustice to retain this cadre. Via our administrative system the whip hand was passed from the British to the Indians both administrators and politicians could use the power. And justify this rank in a future article. The US army has Sargent major as the chief of the enlisted men but that’s NOT equivalent to the Indian army JCO. Perhaps half the JCOs should be promoted to officers and the rest allowed to retire this would solve our officer shortage. The truth of the matter is there is not enough money in the kitty, to cater for Army demands. Our Indian WW2 Army is too big, it has to be cut down to less that 200,000 and a large amount budgeted for modernisation. The general as former N Army commander would know that the Indian Army in its present state is not fit for purpose. Here size does not matter, Babur invaded India with only 12000 men, the Roman legions defeated large tribal armies, Napoleon at Austerlitz took on a much larger force. Bankrupt Pakistan will become a vassal state of China, the mountain wall will not protect us, the future invasion will come via Pakistan with Chinese/Pakistani troops. All invasions of India have come from this direction. The counter arguments no doubt been genuine concern, it’s totally the bureaucracy babudom of cunning and selfish armchair paper tigers of Ministry of Defence and not the BJP or Modi Govt wrongly quoted, the anamolous exclusion of armed forces from any benefits have been historical in nature right from Nehru thro Indira and Manmohan Singh days and to bluntly claim present govt would be doing extreme disservice to it and thereby again shielding the evil ways of the babus. Fact of the matter has been well stated in the article by the General. Unfortunately, our hierarchy doesn’t permit Audacious leadership, on the contrary we’ve candyman toppers who expect same in return as long as they’re in chair. Some of them are even getting caught in various scams and scandals. How many OBC’s (Officers Below Colonel’s) rank in these immoral cases? How many OBC’s you find getting awards as compared to the Elite Sword Club? Do you really think all lowest level fire fights are carried out by The Elite Swordsman? How many of them get martyred in action? Is Chetwode Credo only meant for OBC’s, The Elite Sword Club is exempted from it? These are some of the issues being debated all across rank and file. We can choose to ignore but can do that for long. The latest NFU of OBC as well JCO/ORs and open Cantt have given lots of cannon fodder. I hope we get someone like Sam Bahadur or Carriappa. They both appear to be fictitious and hard to believe that people like them even existed. A very sad state of affairs indeed. We badly need Operations across both frontiers so that paper tigers get sorted out, too bad there’s no other way to expose these wolves in disguise. Most stupidest article ever. Linking primotions of IAS officers to that of army. IAS recruited per year is 1000 while army officers recruited are at least ten times of it. At any point of time there cannot be more 50,000 IAS cleared persons at working age and retired while army officers at working age plus retired numbers to more than 5lakh. So how can such huge number of persons granted promotions? Bhai…. teri pakad naa hai. 10000 officer kahan bharti hue 1 saal mein. Poore saal mein maximum 700… jyadatar kam… rate of retirement bhi jyada hai. Aise bhi chhod dete hai aur kayi shaheed ya shareerik roop se unfit bhi ho jaate hai. Kami bhi hai. Aur bhai desh hai… ek dukaan wala bhi do security wale rakhta hai… aur yeh to desh hai aur wo bhi dushman se ghira hua, apaatkalin gatividhiyan jaise baad, bhookamp se bhi tarast…madat bhi chahiye tujhe… tu pada likha laage tha lekin aisa he hai tu. Desh ki seema surakshit hai isliye ho raha hai karobaar nahi to iss duniya mein kayi udhahran hai barbaad desho ke…. aur haan…shukar hai lekhak section, plaatoon se upar uthaa😆..
You must have your figure correct es . Don’t know where have you taken the figure of 5 lakh from. The total authorised strength of officers in Armed Forces is not more than 50,000. Obtain the % of Armed Forces Officers vis a vis IAS officers getting promoted at various levels of length of service. You might get shocked to see the difference. Get in touch with any of your relative or friend in Armed Forces, if any, you would be enlightened. The most correct view. I am a retired IAF person and got 750/_ rupee as orop. It is a joke on soldier who boast of nationalist in name of soldiers. Why do retired generals open their mouth only after retirement and not while serving???? Because when in service, they have proper official to escalate their concerns. Once retd, they have the right to worry for their brethren. What is your qualification to question the generals? They are bound by service codes to not speak to media while in service. They speak out after retirement when their concerns through official channels are not addressed. You have also offered no different arguments.